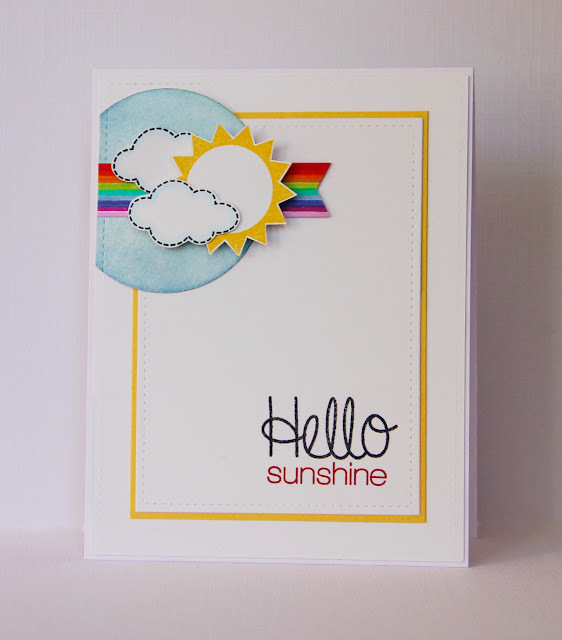 I inked a shiny blue circle using dye inks and Perfect Pearls, then added a cluster of clouds and sun from Whimsy Stamps' Happy Hello'. I haven't got a rainbow die (next on the wishlist) and tried several times to create a curved rainbow using Copics. My seven year old son could have done a better job so in the end I just kept a straight edged flag, as in the sketch, and used a ruler to create a Copic rainbow. Love your cluster of clouds, sun & rainbow! 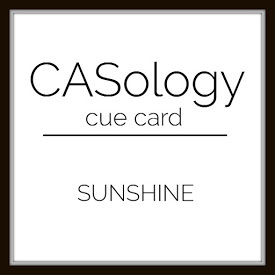 Thanks for playing along with us at CASology this week, Claire! Look, I don't think you need a rainbow die, Claire! ;-) This looks spectacular! That rainbow banner rocks! Such a great take on the cue! 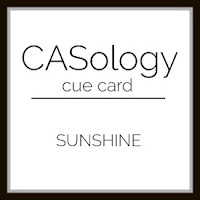 SO glad you could join us this week at CASology, Claire!! This is adorable!! I love the sun and the fun little rainbow strip. Great card! !